then please consider a Donation. With your Donation we will be able to do more research, save more Custom Car History, save more old photo collections, document personal stories and do much more. Help us save Custom Car History that otherwise might get lost forever. 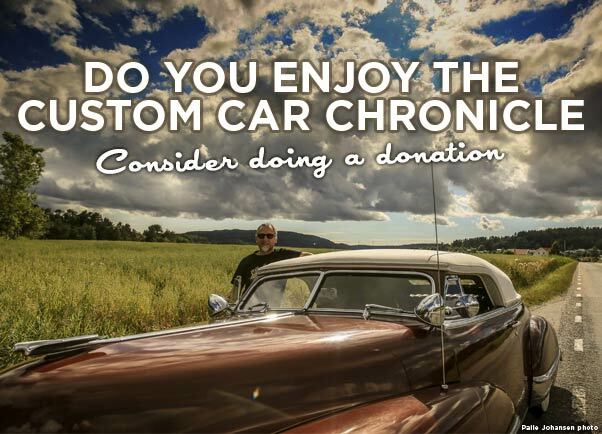 Make a difference and be part of saving the Custom Car Heritage for future generation. Any amount will be extremely helpful. A short history of what we do. Since 2004 I have been spending a lot of my spare time sharing my passion, Custom Cars. The history of the cars, the people who built them, the owners, the design, and the stories behind the Cars and the people involved, with everybody online. In the early 1980’s, when I was in my early teens, I developed my passion for Custom Cars. It would take many years from the early 1980’s before I would be able to discuss these cars with other people. Since where I lived – in the Netherlands – most people never even heard about Custom Cars. In the 1990’s I started to collect old Custom Car magazines, books and photos, and started to study them really well. I started to make files of the famous and not so famous Custom Cars, and Custom shops, to help making my study a lot easier. In 2004 I discovered Fotki, a photo-sharing website and decided to start scanning my research material for my own, and my friends usage. The response from my Custom Car friends from all around the globe was so positive that I decided to open the collection to the public, and name the site The Custom Car Photo Archive. Since then, March 2004, I have been sharing my passion for Custom Cars with everybody who was interested in Custom Cars. There are now over 120.000 photos and documents on the Custom Car Photo Archive. The Custom Car Photo Archive has become the world standard for images of Custom Cars, and has served thousands of people world wide and inspired many people in building their own Custom Car, or just get their daily Custom Car fix. The Custom Car Photo Archive site is really wonderful for collecting and sharing photos, but the site was not really suitable to share full stories or researches etc. After having shared my researches, insights, designs and shared stories on a few car related message boards, and many print magazines, I decided in early 2013 that it was time for me to start my own online-magazine, with the help of my wife we created the Custom Car Chronicle. The Custom Car Chronicle is a website, or online magazine for the Custom Car enthusiast from all over the world. The site has a main section where full articles are shared, written and/or edited by me, Rik Hoving, and a Forum/message board and Marketplace where everybody can share their info, photos, stories and sell or try to buy Custom Car resulted items. The main site is designed so that I now can share the photos, as could be done on the original Custom Car Photo Archive site, but also can add full stories in a way that looks really nice, like a magazine. This was something I wanted to do for a long time, since I feel this is the best way to share the wonderful world of Customizing. Nice photos, with a nice lay out and text and photo captions to make the tories come to life. In June, 2013 the Custom Car Chronicle website was launched. As of this writing (May, 2015) we now have 435 complete articles on the main site and a large number of very interesting posts on the CCC-Forum. We work together with several other contributers who supply us with amazing Custom Car related stories. The website is visited by thousands of Custom Car enthusiasts on a daily base, who are enjoying the historic, personal, design, road-trip, in depth, etc related Custom Car articles. Since the beginning the CCC has become a new online standard for the Custom Car enthusiast. Many people have shared their collections, stories or historic information with us on the site, and we are looking for many, many more. From the beginning I have spend as much time as I could on the CCC, maintaining the website, and filling it with as much content as possible. Always trying to make things look at their very best. And I hope to be able to keep doing this for as long as possible, since this is what I love doing, and I know I’m good at. However spending time on the CCC and maintaining the website is very costly. So far the website has always been free for everybody to visit, use, and share. Recently we added a print easy option on the site so that the articles can now be saved as pdf, or printed easily and saved in your own digital or analog archive. We will try whatever we can to keep the CCC free for everybody! But we hope that you, the visitor of the Custom Car Chronicle who enjoys what we are doing, consider donating some money to keep us going. And keep us doing what we do best. Researching Custom Cars and their wonderful history, and sharing out finds with the rest of the Custom Car enthusiast all over the world. Every donation will be very much appreciated and be used in full to benefit the Custom Car Chronicle. Besides money donations we are of course always looking for interesting “old” Custom Car related photos, other material and stories. The more the better. If you want to share/donate any of these, then please Email Rik and we will get back to you as soon as possible.